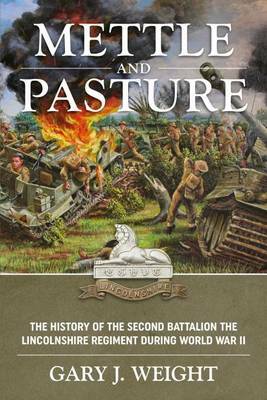 Mettle and Pasture - the story of the part played during the Second World War in Europe by the 2nd Battalion The Lincolnshire Regiment. Entering France in September 1939 as part of the British Expeditionary Force (BEF) they witnessed from the front line the blistering attack on Belgium at Louvain and first-hand the German Blitzkrieg beginning on May 10th 1940. Fighting a fierce rearguard action as part of the British 3rd Infantry Division under command of General Montgomery, the Battalion covered the frenzied withdrawal of the British Army through the carnage of Dunkirk, arriving back to the shores of England with less than 25% of their original force. On 6th June 1944, almost four years to the day after the demoralizing evacuation at Dunkirk, the Battalion landed on the coast of Normandy on D-Day. Told in their own words, eyewitness accounts and memoirs are expertly weaved together with official war diaries to recall the experiences of the infantrymen at the front - from the days in France and Belgium in 1939 to the assault on Normandy, spearheading such a great invasion, to resisting and attacking the enemy at Caen and blunting the formidable Panzer counter-attacks in the dangerous Normandy Bocage. From 'out of the frying pan and into the fire', come the bitter battles in Belgium and Holland, the attrition of holding the Maas River during the coldest winter in living memory, and finally on into Germany, fighting the SS around Bremen just hours before hostilities ended on the 8th May 1945. Vivid accounts tell tales of courage and fear, individual sacrifice and how soldiers faced up to the enemy under fire, sharing danger and surviving the savage conditions but also of the pride and honour of belonging to such a famous and historic regiment - The Lincolnshire Regiment. With an abundance of previously unpublished photographs and clear, concise maps of the battlefields, this is the story of the war the way it really was for an infantryman - told by the men who were there.